One in five students in the United States—19.4 percent—attends a public elementary or secondary school designated as rural. The view outside the classroom window for some of these students is “one of scenic fields, pasture lands, or forests nestled at the base of mountains.” But variations across rural America can be stunning. Some students have a view of the polluted coastline where their parents, grandparents, and even great grandparents used to make a living, the abandoned mining equipment that once tied their families’ livelihoods to the company store, or the vast clear-cut space that was once a forest amid rolling hills. These visual contrasts mirror the diverse cultural, social, economic, and political realities that make rural places what they are today. The situations surrounding rural education—like the views from the classroom windows—vary widely from place to place. But what rural places have in common is the challenge to provide a quality education to ensure the success of some 10 million students. This challenge often comes with difficult odds—inadequate financing, teacher shortages, and inaccessible or unaffordable services for children and families. The partnerships and approach of “full-service community schools” may hold the greatest potential for addressing rural education’s challenges and ensuring that every child has at least a near-equal opportunity to succeed. This paper combines data from the literature and other public sources, interviews, site visits, and the organizational experience of The Rural School and Community Trust in an examination of community schools from a rural perspective. It provides a context for rural community schools and discusses the need for clarification of the language used to describe the concept of community school. 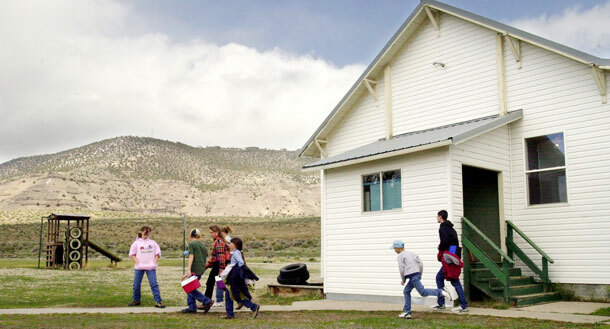 Three examples of successful rural community schools provide a framework for discussing the benefits, characteristics, and policy implications of rural community schools. States and rural districts should develop a rural teacher recruitment strategy that emphasizes the benefits of teaching in a community school. An important aspect of state rural recruitment strategies could be permitting local school boards to implement community educator certification programs. This would allow school districts to place highly skilled and knowledgeable community members in classrooms under the supervision of highly qualified, highly effective teachers of record. This type of program can facilitate the movement of parent and community volunteers into the teaching profession in understaffed areas, particularly when combined with emerging “grow-your-own” teacher recruitment and reten- tion strategies. Rural schools and districts should remove barriers to substantive parental and community engagement in schools. Districts and schools can develop programs and services that bring adults into the school building both as consumers and as volunteers, and they can revise policies that discourage parent and community engagement. Schools should partner with community-based, nongovernmental organizations to provide alternative venues for parents and community members to participate in decision making and interact with children in academic and nonacademic contexts. New school planning should incorporate multiple related community needs. Local governments should consider bringing together schools and child and family services under the same roof before deciding to build new structures or otherwise providing separate housing for schools and services. States should harmonize construction standards by categorical funding sources when it does not compromise the public purpose served by the standards. States should help to reduce financial risk to community school partners when they undertake new construction projects. State legislatures should create and administer a joint-use-guarantee fund that insures against loss of fiscal capacity to meet bond payments when a partner is forced to abandon the joint-use facilities before the terms of the financing are fulfilled due to state or local government action. Legislatures should also create a Rural Joint Use Public Facilities Commission to identify statutory and administrative barriers to joint-use facilities and recommend policy changes specific to their respective states. Congress and state legislatures should provide incentives for, and place special emphasis on, the development and implementation of community schools as a turnaround strategy for high-needs Title I and other low-performing schools in rural areas. The current restructuring strategy for underperforming Title I schools requires the district to replace teachers and school leaders. This strategy is often not feasible for rural schools that have a smaller pool of potential teachers and administrators from which to draw. Community schools are a promising alternative strategy for these schools in rural areas. Congress and state legislatures should increase investments in community schools. State governments should fund strategic planning processes for community school development and implementation in rural places, the federal government should increase funding for the Full Service Community Schools Program, and the U.S. Department of Education should provide technical assistance through intermediary organizations to help level the field for rural districts in competitive grant competitions. Full-service community schools may well provide the greatest opportunity for quality education and success in rural communities where resources are few. Community schools offer a much-needed alternative to traditional schooling models even in rural communities that are not economically stressed. Doris Terry Williams is executive director of the Rural School and Community Trust and director of the Trust’s Capacity Building Program.